It’ll be a white carnation for me this year. Some churches turn Mother’s Day into some kind of crazy contest: the mother with the most kids; the mother with the most kids present that day (the kids, of course, having been guilted into doing their offspring duty “or else”); the mom with the youngest child, etc., etc., nauseatingly, etc. The warped part of me always wanted to turn the contest weird: the mother with most kids present who were also on the FBI’s Most Wanted List; the mother who could juggle at least three of her kids at once (literal juggling, I mean…not the life juggling, super human, yet ordinary feats of mothering). But this “contest” approach always seemed to spank those with unsatisfactory mom experiences…those who desperately wanted to be moms but couldn’t; those present whose moms weren’t very momish at all; those moms whose life’s horrors included their children preceding them in death. Shoving a book in the hands of the “contest” winners always seemed to somehow violate the quiet places of pain in the hearts of the moms who weren’t or the moms who couldn’t (though they tried oh so hard), or those whose moms just weren’t…really moms, that is. I have seen the grimaces and the winces and the forced smiles on those who had wanted to be (but couldn’t be) moms and on the faces of those who wished that their mom had really been a mom. That, of course, is not a reason to entirely forgo church-based Mother’s Day celebrations. So in my grandness of pastoral wisdom (ha! ), I decided years ago that if I were planning worship services on Mother’s Day, the celebration would be simpler. Worship attendees could take a white carnation if their mother had passed away and a red carnation if their mother was still living. It’ll be a white carnation for me this year. It’s been several months since my mom slipped from this life to the next. It was a final gentle slipping after weeks of discomfort and pain. It has been several months since I have had to learn to not ask to talk to her when I call my Dad. I still catch myself on those calls…about to ask for my Mom. It would be really great to just hear the gentle lilt and pitch and cadence of her voice. I so still miss the, “Hi! Honey,” when she took the phone. No matter what was swirling around her, no matter the pain she was in, as long as she could, she still blessed me with those words. Missing Mom at Christmas took me by surprise because the missing snuck up on me with such stealth…a Pearl Harbor or a 9/11 surprise attack on my spirit. I had even been waiting for the Christmas pain and yet it still managed to knock me back on the ropes and hold me down for the count. On the lookout for the frontal grief attack, I instead got waylaid by grief’s sucker punch. I don’t want to transmogrify her into some kind of super saint but she was a great Mom. 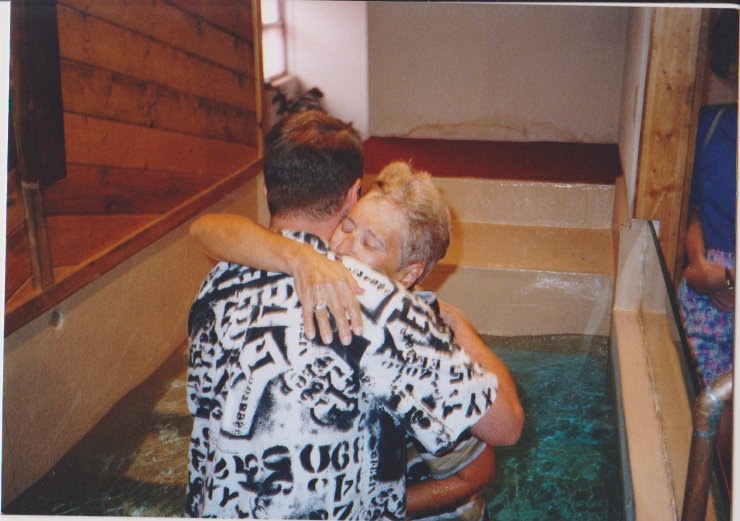 The floodgates opened when my brother sent me pictures he had taken years ago when I had the privilege of baptizing my Mom. Such a precious memory so readily timed in its release. I’ve looked into so many expressions of comfort…the books…the poems…the Facebook “Likes” and “shares” and “me too’s!” There is nothing profound there; there is nothing profound to say in the face of so profound a loss. You can’t really prepare for this loss…folks who talk about “anticipatory grief” are just trying to help us think ahead. But honestly, they have no clue. Really, before the loss, it’s just so much holding your breath and wondering if the only breath you will have after your loved one passes is the breath you’ve been holding…and you know you will eventually exhale and you wonder what comes next. And then you try to inhale and you find, in those moments, that you just cannot breathe at all. The thing I was most unprepared for was the constancy of the loss. Perhaps that will fade in time. Part of me hopes not…please, no. Even though my Mom and I were geographically distant for the last several years of her life, I always knew she would be there when I called and I always knew I could go home and get a hug from Mom…anytime. Now I feel the gaping hole in my sphere of existence every day…every minute. And while I want the sorrow to diminish; I also want the ongoing presence of my Mom…and, if the only way I can have that is to have the sorrow; I’ll keep the sorrow. I have the genuine Christian hope that we will be reunited…but hope is not the same as the tangibility of a call…a voice…a smile…a pierogi (Mom made the best). She will not come to me but I will go to her (thanks, King David, I really needed that). And I hurt for my Dad who longs for the company of his life partner of over six decades. Through thick and thin (mostly thin) they made a life together that was monumentally solid and full of the kind of giving that only those without depth of resources can do…a giving of compassion and spirit and presence. It’ll be a white carnation for me this year. Holding that flower means that Mom has passed from this life and slipped into the next. First Mother’s Day with the Heavenly Father. Joy for her; sorrow-tainted joy for me. It’ll be a white carnation for me this year. This entry was posted on Thursday, May 8th, 2014 at 9:10 am	and tagged with grief, heaven, Heavenly Father, joy, Mother's Day, sorrow and posted in Uncategorized. You can follow any responses to this entry through the RSS 2.0 feed.